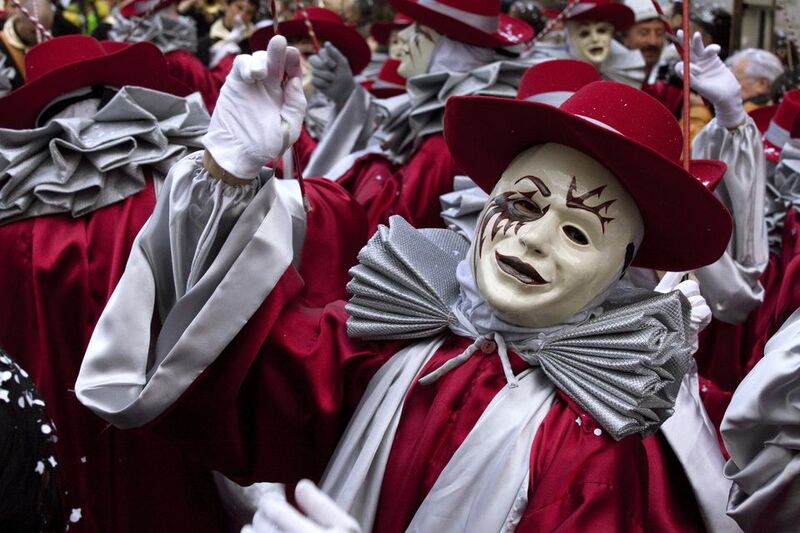 Limoux Carnival in Languedoc-Roussillon is the world’s longest running carnival. It takes place from mid-January to just before Easter, although it's only at weekends until the last week when it becomes a daily feast. Limoux is different from other carnivals in that it's more a local folklore celebration than a universal parade. Bands playing traditional music on trumpets, clarinets, basses, double basses and bass drums are led by the bandes de carnavaliers (bands of revelers) through the arcades of this pretty and ancient town. The traditional costumes are spectacular and include the Pierrot, the goudil which can run from the ordinary to the most noble, though always with a tongue-in-cheek touch, and the classic black domino, decorated with satin bands of bright sparkling colors. The bands of revelers are the 'guilds' who play music and sing songs, but it's not as carefree as that sounds. The reason is satire, making fun of society and its rules, all conducted in the ancient Occitan language. The most impressive of these processions is the torchlit one at night, where you really do feel that the ghosts of the past are gathering. There are exhibitions and events all through the carnival, but the main processions take place on Saturdays and Sundays at 11 a.m., 4.30 p.m. and 10 p.m. While the bands who lead the procession are locals, you can join in (provided you dress up and the more obscure or strange the better). Become one of the followers of the bands through the streets, stop at cafes for a quick glass of wine before the final stop in the main square, la place de la Republique. The carnival ends with La Nuit de la Blanquette, the night when His Majesty King Carnaval is burned at the stake in the main square, la place de la Republique. A straw effigy, he is the scapegoat who takes the blame for the "sins" people have committed during the festival. Check out hotels in Limoux, compare prices, and book on TripAdvisor. Little Dunkirk (Dunkerque) holds the biggest and most popular carnival in northern France, running from the end of January to the middle of March on weekends and certain weekdays. And it prides itself on being the noisiest event of its kind. It began in the 18th century as a special feast before the visscherbende (groups of fishermen) set sail for the icy and dangerous Icelandic water to catch the lucrative cod. Dunkirk Carnival is certainly local and has games and songs that might leave you totally confused. The action revolves around the fisher bands who confront each other with songs as they parade the streets. A costumed drum major leads the musicians dressed in yellow fishermen's raincoats while the crowds sing traditional songs and roar their approval. It has all the elements for a successful festival: Giants (who are not burned), music, satire and a general sense of madness. The parades last around 5 hours from 3 to 8 p.m., finishing at the Town Hall where the crowds demand "what they deserve," that is 450 kilos (992 pounds) of kippers which are traditionally thrown off the belfry. The parade then makes its way to Jean Bart Place for more singing, as well as celebrating sailors and honoring Jean Bart, a French naval commander and pioneer from Dunkirk who had considerable success against the English (the natural enemy). The streets of Strasbourg light up with over 40 floats and around 3,000 processing from the Quai du Quai du Général Koenig, to the Place Kléber two hours later. There’s a rehearsal on Saturday then the actual parade on Sunday. It’s fun and loud and has live music on the stage in the Place. Then it’s up to you to make up your own after-Carnival party in the bars and cafes that stay open around town. The 2019 Strasbourg Carnival parade takes place Sunday, March 10, 2019, at 2:11 p.m. Check out Strasbourg hotels, compare prices and book on TripAdvisor. Taking place at the end of February or beginning of March, Mulhouse erupts over a weekend in a traditional festival that was regarded as one of France’s greatest between 1920 and 1935. World War II intervened and it wasn’t until 1953 that a local group of guilds decided to revive the carnival. Southern Alsace knows how to enjoy itself and the Carnival attracts groups from all over Europe. Being on the borders of Switzerland and Germany, it has an international flavor to the parades that march past the town hall. Like all the other carnivals, it’s satire that is celebrated here. It also has an all-night parade with bars and restaurants staying open until the final revelers make their weary way home. The 2019 Mulhouse Carnival takes place from March 7, 2019 - March 10, 2019. Check out hotels in Mulhouse, compare prices and book on TripAdvisor. Nice Carnival is one of the world’s oldest, the earliest reference dating back to 1294. Today it’s a glorious party taking place daily except Mondays and Thursdays. The city of Nice erupts day and night with parades of floats culminating in Mardi Gras on the last day. Historically Nice Carnival was the last chance to indulge in rich foods and drink before the 40-day Lent fast, and the chance to disguise your identity behind fantastic masks and enjoy pleasures forbidden by the Catholic church during the rest of the year. Nice Carnival begins with the arrival of the carnival king in his Corso Carnavalesque (Carnival Procession) in the Place Massena. Around 20 floats take the theme of the year with giant puppets (called grosses tetes or big heads), and 1,000 musicians, street artists, and dancers from all around the world. The King takes the keys of the city and declares his brief reign of extravagance and excess. There are spectacles during the Carnival as well as the world-famous Bataille de Fleurs (Battle of Flowers) which takes place on various dates throughout the Carnival. The streets are full of stalls selling gifts and food and a crowd of visitors there to have a good time. It feels feel that Spring is beginning. On the last night, King Carnival is burned. Then there’s a gigantic firework display to music over the Baie des Anges, the soaring fireworks reflected in the waters of the Mediterranean. 2019 Nice Carnival takes place from February 16, 2019 – February 28, 2019. Check out hotels in Nice, compare prices, and book on TripAdvisor. The Menton Lemon Festival runs on Sundays from mid-February to the end of the first week in March. It’s like a carnival but known as a festival when the citrus fruits that bring Menton its wealth and reputation are celebrated. All sorts of different events are on offer. There’s the Sunday Corsos des fruits d’or (Procession of Golden Fruit Floats) when decorated floats move along the Promenade du Soleil bordering the sea accompanied by musicians, folk groups and majorettes. On selected days there are evening processions of orchestras, folk groups, and dancers who encourage wild behavior as they go through the streets, followed by fireworks over the bay. The Biovès Gardens host the jardins de lumières (Gardens of Light) which fill with sound and light effects. There are various exhibitions in the Palais de l’Europe, next to the Gardens: The Festival des Orchidées (Orchid Festival), and a highly popular Salon de l’Artisanat (Arts and Crafts Fair) of traditional products of the region inspired by lemons: jams, jellies, honey and liqueurs; soaps and perfumes and glass engravings, ceramics and more. There are various guided tours (of a jam factory and the lemon grove for instance), and the chance to visit the gardens of the Palais Carnolès which has the largest collection of citrus fruit in Europe: from grapefruit trees to kumquats, mandarin orange to clementine trees. And finally, you can buy the citrus fruit used in the festival to make copious amounts of jam, syrup and more. Some of the events are free, but you need to buy tickets to see the parades. The 2019 Menton Lemon Festival takes place between February 16, 2019, and March 3, 2019. Check out hotels in and around Menton, compare prices, and book on TripAdvisor.